Plunge yourself into the Dead Sea and you’re plunging yourself into one of the most nutrient-rich environments on the planet. It’s one that has the power to treat numerous ailments, clear up stubborn skin conditions and attract tourists from across the globe. Even if you’re short a plane ticket to Israel, you can still enjoy the health and wellness benefits of the soothing Dead Sea waters from the much-closer comfort of your own home in the form of a Dead Sea Black Mud Mask. While the high salt content ensures nothing beyond microbes can survive in the Dead Sea, Discovery’s HowStuffWorks reports its waters are alive with a lineup of nutrients known for their life-giving qualities. You can bet those nutrients seep deep into Dead Sea mud. Mingle the melange of minerals with brine and you find a realm of therapeutic benefits only nature itself could be brilliant enough to create. Body detox tops the list of benefits from a Dead Sea mud masque, thanks to mud’s magnificent abilities to draw impurities out of your skin. 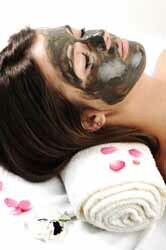 Combine the aforementioned melange of minerals with the detoxifying mud and the Dead Sea facial mask not only takes the bad stuff out but can put a host of good stuff in. Skin soothing is also high on the list of benefits, with Dead Sea mud hailed for treating severe skin conditions while giving skin an overall boost by refining your pores. Use it to specifically treat acne, or dry skin conditions such as eczema and psoriasis or give it a whirl to make healthy skin even more vibrant. While powerful in its effects, a Dead Sea organic facial mask is gentle enough for regular use on all skin types. Skin cleansing takes a firm place on the benefits list. Dead Sea mud makes a habit out of sloughing off dead skin cells and improving circulation to the living ones. This can leave skin plumped-up, smoothed-out, silky sweet and glowing with a youthful, healthy sheen. Due to its super-high concentration of nutrients, a little Dead Sea mud goes a long way. Simply spread a thin layer of the mud across your face, neck or other problematic areas and sit back to relax. Keep the mud masque in place for up to 20 minutes then rinse with warm water. For in between Dead Sea mud facial masks and as a luxurious and beneficial skin soap also try pure Dead Sea Mud handmade organic soap.